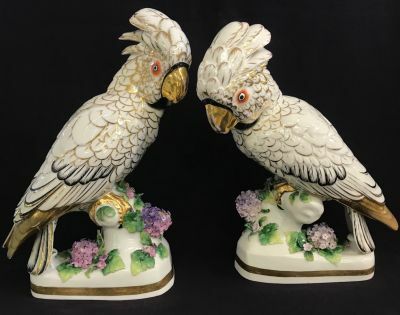 Continental European porcelain Cockatoo figures. The trademark is an anchor type mark; possibly Samson imitating Chelsea, French, 19th century. There is restoration to the larger figure and minor loss to the flowers. The taller bird is 12 3/4” high. The bases are 4” by 7”.